What is sound? At a moment when modes of sonic representation and transmission bring into earshot sound from previously unheard realms—the deep sea, the inside of the head, outer space; when new technologies make it possible to conjoin hearing and deaf worlds through a common currency of vibration; and when techniques of “sonification” render audible nonsonic material and information (sun spots, climatechange data, nineteenthcentury visual tracings of vibration patterns)— the definition of “sound” has expanded to access worlds previously inaudible, even unimagined. 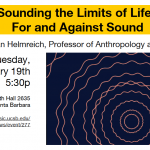 Thinking through recent technologies of transduction, eduction, and sonfication, this talk asks how we should conceptualize sound — as object? as event? as waves in oceans of media?